Are you ready to incorporate project-based learning into your curriculum? 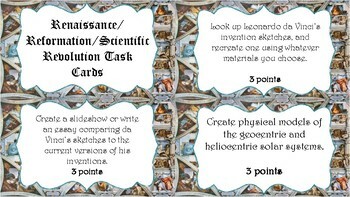 These are the extension project task cards I use for my Renaissance/Protestant Reformation/Scientific Revolution unit. Each project is given a point value based on the depth of the project. These are fun projects that allow students to be creative while reinforcing learned concepts. Includes a page of blank task cards for your use!